A Taste of History with Joyce White: Cranberry Pie: A Tasty and Historic Addition to the Thanksgiving Table or Anytime! Cranberry Pie: A Tasty and Historic Addition to the Thanksgiving Table or Anytime! Here is a recipe from one of my favorite American historic cookbooks, The American Frugal Housewife by Lydia Marie Child, published in 1832. The floral scent of the cranberries is enhanced by the addition of cinnamon. This cranberry pie is perfect for Thanksgiving Day or anytime of the year. Enjoy! From, The American Frugal Housewife by Lydia Child, 1832. Cranberry pies need very little spice. A little nutmeg, or cinnamon, improves them. They need a great deal of sweetening. It is well to stew the sweetening with them; at least a part of it. It is easy to add, if you find them too sour for your taste. 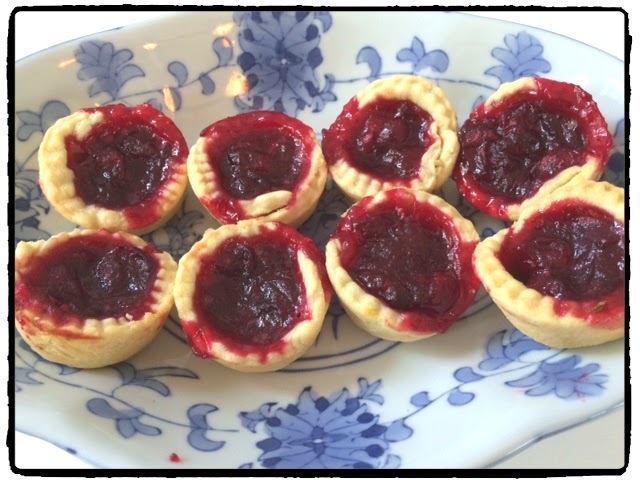 When cranberries are strained, and added to about their own weight in sugar, they make very delicious tarts. No upper crust. Preheat oven to 350° F. Line a pie plate with the pie crust. Keep in refrigerator until needed. Wash cranberries. In a medium-size saucepan, add the water and the sugar. Boil until all of the sugar is dissolved in the water. Add the cranberries and cook on medium heat until they soften and start to burst, about 8-10 minutes. Add the spices. (You can add other ingredients here if you like, such as raisins, apples, pears, etc). Pour the cranberry mixture into the prepared pie crust. Bake for 40 minutes or until the cranberry mixture is set and the pie crust is golden. Cool completely before serving. Serve as is or with whipped cream. Line 32 mini muffin molds with pie crust dough (bottoms only). Bake mini-tarts for 22 minutes.